Iochdar Hall was the venue for a surprise ceilidh on Friday 16th March. Dr Kate Dawson was presented with a crystal plate in recognition of the many years of work she has put in to improving the recreational and sports facilities around Iochdar School. She also received an enormous bouquet of flowers. 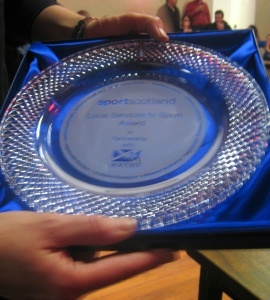 The award is presented annually, and is sponsored by SportScotland and the Scottish Association of Local Sports Councils. The main criterion for the award is that the nominee has to have made a significant voluntary contribution as an administrator, coach or official to local sport over a lengthy period of time. The Award takes the form of an inscribed ‘Edinburgh Crystal’ Plate and is retained by the recipient in perpetuity. The evening was organised by fellow committee members, with Mairi Bremner conducting the proceedings from the front. After several dances and musical interludes, Mr Ronald MacKinnon, chairman of the Uists and Barra sports council, presented the award. The event also raised funds for the school playground project, which is currently underway. ‘It is also worth noting the sequence of events that led to me getting this award. In 1994, when my first daughter was a baby, a friend mentioned that she was thinking of setting up a Croileagan locally, was I interested. I immediately said yes, little thinking I would end up as secretary of the committee. Thanks to Ann Marie Johnson and Nanag Skivington, the Croileagan introduced me to a world of community development. They were the first of many friends and fellow volunteers I have made along the way. 'The Croileagan work brought me to realise the paucity of suitable outdoor facilities for young people in our community, at the Croileagan and in our primary school. Over the first few years, I became increasingly frustrated with the phrase ‘They should…’ before sounding off about some problem or other, including the playground at the school. In my world, for they, read ‘WE’. This was an extremely enjoyable event, with lots of dancing, talented young musicians, and a wonderful celebration. The award is a valuable way of recognising the contribution of volunteers over the years, and highlighting their achievements. In this instance, Dr Kate has worked away relentlessly for over ten years to ensure that appropriate facilities are available at Iochdar School and Croileagan an Iochdar.